With a windfall of funding from the Measure M sales tax increase that passed in 2016, the Los Angeles County Metropolitan Transportation Authority (or just “Metro” for short), is embarking on something of a construction spree, hoping to complete five rail projects, and three new bus rapid transit lines (by my count), in time for the 2028 Olympics. But with all these new routes coming on line, Metro is running out of the colors they have traditionally used to name their rail and BRT lines (except for the oulier “Expo” and “Crenshaw” lines, which take their names from adjacent surface streets). As Laura Nelson reported in the LA Times, Metro is considering a transition to numbered or lettered lines to help minimize confusion. Nelson’s story notes that a switch to numbered or lettered lines would bring LA in line with “the subways in other world capitals, including New York or Paris,” as if this is some sort of indicator of a “grown-up” transit system that a “real city” would have. But what Metro seems to have neglected are the myriad cities around the world that do just fine without resorting to anonymizing numbers or letters, all of which have more extensive systems (at least for now), and have been in the rail business much longer than Metro. Chicago “L” map, via Chicago Transit Authority. Chicago may be the first city to scoff at LA Metro’s insistence that colors are an insufficient signifier for multiple rail lines. The Chicago Transit Authority operates eight rail lines differentiated by colors. 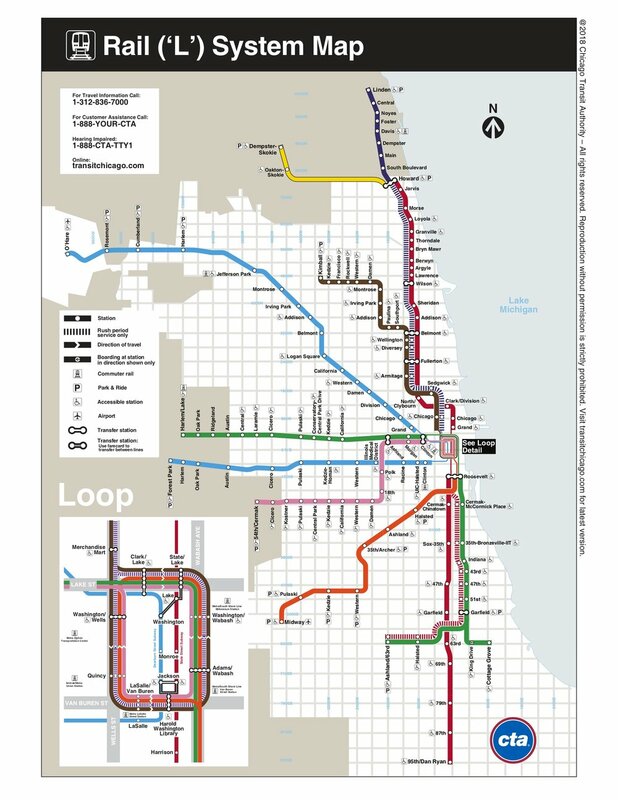 And though some may find it slightly difficult to differentiate between the similarly hued Pink, Orange, and Red lines (especially where the three intersect and overlap in the Loop), CTA is so confident in its color scheme that the system maps don’t even indicate the naming scheme, all you see is colored lines and station names. London Tube Map, via Transport for London. Similar to London, the Tokyo subway system uses proper names for each of its thirteen lines. Each line is also differentiated on maps by a distinct color, but like London, those proper names are the primary identifier. One unique feature of the Tokyo system that could be instructive for LA Metro is that in addition to the line names, each line has a letter signifier that corresponds to the first letter of the line name. And then each station is indicated by a name, and also by the line letter and a unique number for that station. For example, Tokyo Station is station M17 on the Marunouchi subway line. This convention could also be a source of confusion when multiple lines converge—a frequent occurrence in Tokyo’s spider-web of subway lines—where a single station could have three, four, or even five alpha-numeric indicators. Perhaps what is most interesting in the Tokyo example is that these alpha-numeric line and station identifiers seem specifically geared toward non-Japanese-speaking riders, since there doesn’t seem to be an equivalent convention in Japanese. Tokyo subway map, via Tokyo Metro. One of LA Metro’s main concerns with a new line naming convention—and rightly so—is legibility in multiple languages. For some context, the LA Metro website provides information guides in nine languages other than English, and a web translation tool for seventeen languages. The challenges of proving transit information for such a multilingual city immediately brings to mind the example of the Mexico City subway system, where each station is visually represented by an icon or pictograph. Originally created by Lance Wyman, the designer of the legendary visual identity of the 1968 Mexico City Olympics, at a time when the city’s metro system was much smaller, and when literacy rates were lower (or perhaps more accurately, when many riders primarily spoke a native language other than Spanish), the system of icons for each station continues to this day on a network that encompasses twelve numbered and colored lines, in a city where literacy rates approach 95 percent. Even though more recent iterations have strayed from the original historic landmarks that may have been more readily associated with their locations (the tweet below describes an icon designed in homage to mastodon bones found at the site of the station during construction), as Wyman himself noted, because of the proliferation of smart devices, “We navigate our lives now with icons, illiterate or not.” In other words, Mexico City’s icon navigation system may have been ahead of its time. My point is not to say that LA Metro should adopt any one of the systems described above, but rather that it shouldn’t be so quick to abandon a system that has functioned more-or-less effectively for over 25 years. Sure, we’re about to have many more rail and BRT lines, but that doesn’t mean we have to completely throw out the naming convention Angelenos have grown to know (and dare I say “love”?). Why are we so quick to assume that the “right” way to do urbanism is the way someone else has done it? LA has its own identity and history that we should be more eager to celebrate, rather than discarding it in favor of “the way New York does it” or “the way Paris does it.” We should be working to make urbanism work for LA, rather than trying to make LA fit someone else’s mold. There are lessons to be taken from all of the examples here, and maybe especially the case of the Mexico City, where even when the system seems to outgrow the original convention, it can adapt to serve a more complex network. Why not assign letters based on the existing color names, and then adapt future lines to fit? There is almost no overlap in the current naming scheme. (R)ed, (P)urple, (B)lue, (G)reen, (S)ilver, (O)range, (E)xpo, (C)renshaw. The only conflict is the existing (G)old Line, which will soon be expanded out of existence: when the Regional Connector project is completed, the (B)lue Line can continue through downtown, into Pasadena and beyond, and the (E)xpo Line can continue through East Los Angeles (and into the eastern suburbs as the line is extended as planned in the future). And at the risk of falling into the most LA cliché of them all, I will add this one last caveat. Long ago, before today’s Metro Rail was even a glimmer is LA County’s eye, our freeway system was developed with sophisticated-sounding names like “The Arroyo Seco Parkway” and “The Santa Monica Freeway” and “The Golden State Freeway.” Now all of those names are largely forgotten. Instead, we just have “The 110” and “The 10” and “The 5” and on and on for an endless string of numbered freeways (but always, ALWAYS, with the definite article “the”). Let’s not add any more confusion, or association, to the web of freeways that is (literally and figuratively) strangling LA, by identifying our train lines with even more, and possibly conflicting, numbers! LA Metro Rail (and BRT) needs to maintain its own independent identity. But whatever naming convention LA Metro settles on in the end, you can bet that those letters or numbers will always be preceded by the definite article “the.” As much as we may try to emulate other cities, this is still LA after all. Celebrating the beauty of 750,000 people coming together in solidarity, even if there were a few snags in the system.